The Razr M has an AMOLED edge-to-edge display that Motorola says offers 40 percent more real estate than Apple's iPhone 4S. The Razr M will be available for $99.99 after a $50 mail-in rebate and two-year service contract with Verizon only in the U.S., and will be compatible with its high-speed 4G LTE network. The Razr M will also be launching in "several Asia Pacific countries" in the near future. The new Razr HD has a 4.7-inch high-definition display that Motorola said is the most compact smartphone in its class. It allows users to watch up to 10 hours of movies and TV shows, or 6 hours of surfing the Web. The Razr HD will be launching in Asia Pacific, Europe, North America and Latin America. 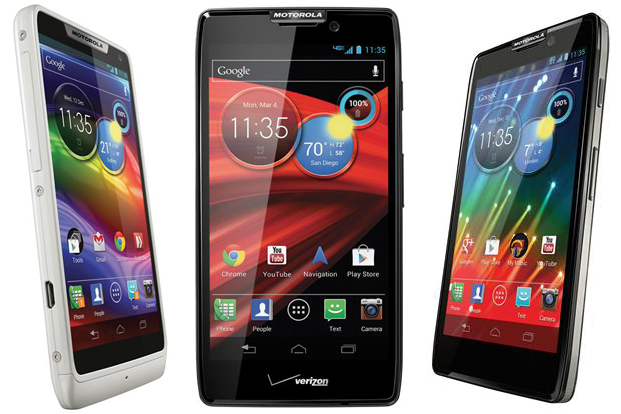 In the U.S., it will be available before the holidays on Verizon's 4G LTE network, and will be branded as "DROID RAZR HD by Motorola." Finally, Motorola also announced the larger Droid Razr Maxx HD, which has the same features as the Razr HD but offers significantly greater battery life. Motorola said the Razr Maxx HD will offer 32 hours of performance based on an average user profile that includes both usage and standby. The Razr Maxx is advertised as offering 13 hours of straight video playback, 10 hours of YouTube HD content, or 8 hours of Web browsing. From left to right: Motorola's new Razr M, Razr Maxx HD, and Razr HD. Motorola is also catering to developers and modding enthusiasts by offering special developer editions of the Razr M and Razr HD. They will be available online only through motorola.com in the U.S., and will allow owners to use Motorola's software tools to unlock the bootloader. Also on Wednesday, Motorola chief Dennis Woodside said his company plans to upgrade all of its current smartphone lineup to Android 4.1 Jelly Bean, the latest version of Google's operating system. For those handsets that cannot be upgraded, the company will offer customers a $100 credit off of one of the three smartphones unveiled this week. Motorola joins Nokia in unveiling its new flagship handsets on Wednesday, one week before Apple is set to hold its own media event where it is expected to unveil its next-generation iPhone. Both Nokia and Motorola emphasized the size of the screens of their latest smartphones. Apple is also expected to increase the size of the display on its next-generation iPhone to 4 inches.